So I baked my first trial batch butter cake. It was supposed to contain canned pears but there is nothing at home but canned pineapples and longan.... Zzz. Egg mixture: Everything was beaten using a Breville WizzMix 320 watt hand mixer. Egg mixture to speed of 4 till it was fully creamed. This took roughly 6 mins. This was then followed by the blending in of the sifted baking powder + cake flour which I incorporated in fully before adding the UHT fresh milk+ vanilla extract. Sifting is important to ensure there are no lumps in the batter, and to incorporate air into your batter. The cake cooked through except for the last 3cm from the bottom which looked a bit raw, after 25 mins at 150 degree celscius. So I chucked it back into the oven for 5 mins + residual heat from the oven. 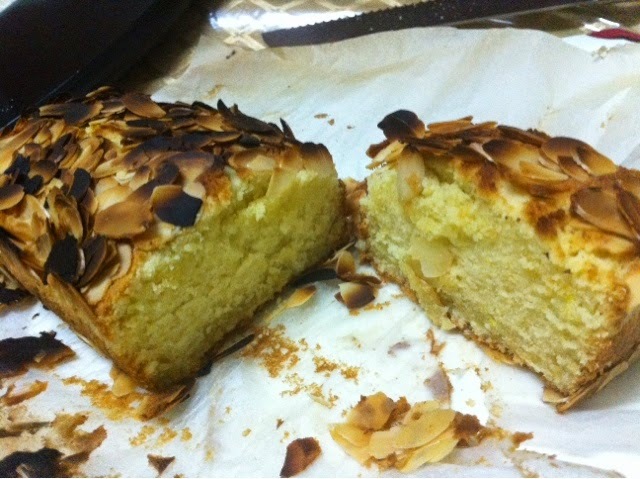 The top was a little more brown and firm, but ended up charring some of the almond flakes so I had to remove it quickly! For glaze,in a porcelain bowl, I microwaved some strawberry jam with water for two mins and brushed over. Normally we use a pot, but reflecting on it, it just takes up too much washing up ! !